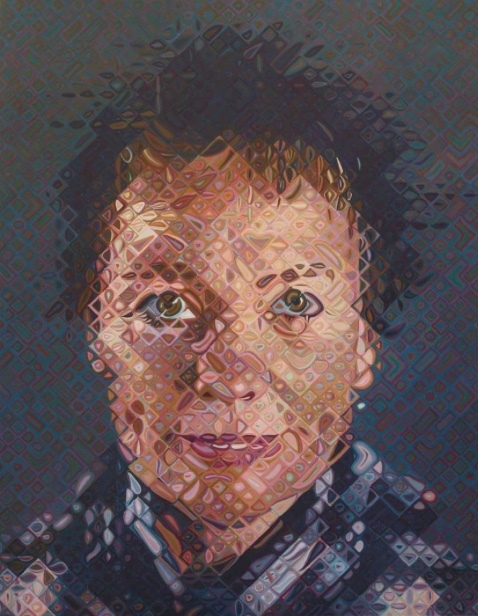 I don’t normally put the work of Johannes Vermeer (1632 – 1675) and Chuck Close (1940 – ) in the same box, but there is a similarity to their process, however different their results. Both pursue the multitudinous variations of tone and shape in their subjects. 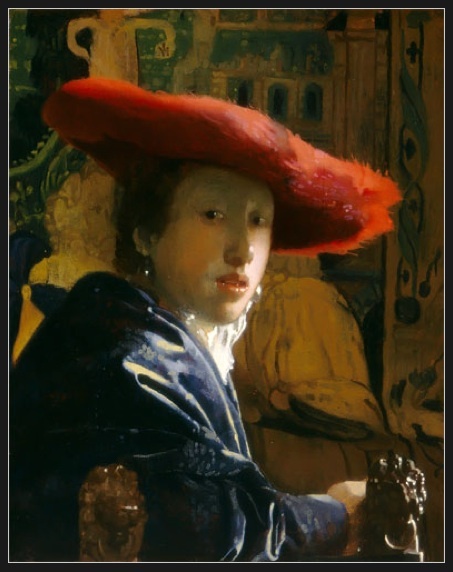 Vermeer pulls adjacent tones together, as in the face below, then at a certain point leaps from light to dark, largely suppressing middle tones. So the face tones, both lit and shadowed, are very close; hair and eyes are suddenly, sharply dark. Close, by contrast, follows a more even progression from light to dark. But both impart a wonderful vivacity to their images by the little sparkly lights that set off the mid tones and darks without bogging down in the flatfooted rendering of each shape. Vermeer uses them subtly–in her hat, her eyes, nose, lips, earrings, lions’ heads–Impressionism two hundred years ahead of time–while Close uses them frontally, and all over, so that his shapes project bounce and discovery rather than Vermeer’s rich and intriguing calm.